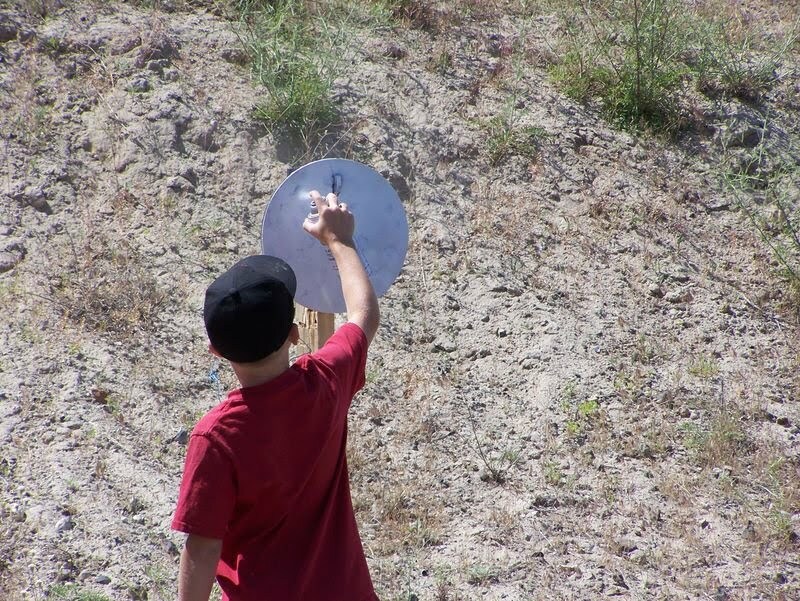 This Saturday just East of Ccoeur d'alene, Idaho, at the range just up the valley from Fernan, they will be holding the Idaho State Steel Challenge Championships, better known as the Eddie Brown Memorial Steel match. It's very well run, in a beautiful (if hot!) location, and we try our best to be there every year. It should take us around six hours on the road to get there, not counting the ferry ride to the mainland from Whidbey Island. We'll let you know how it goes when we get back on Sunday night. A Rendezvous Target EVERYONE Can Hit! You just can't miss at this year's Gun Blogger Rendezvous. It runs September 9th through the 12th. at the Silver Legacy Hotel/Casino Complex in Reno. KeeWee and I'll be there, along with a lot of other interesting folks too, for three plus days of shooting, partying, eating, socializing, and raising money for a really worthy charity, Project Valour-IT. We'll be there! Will you? Would you like to win a brand new Hi-Point 9mm. carbine? One of the lucky folks at this year's Gun Blogger Rendezvous will be the proud owner on a Hi-Point 995ts carbine. The rules are pretty simple. 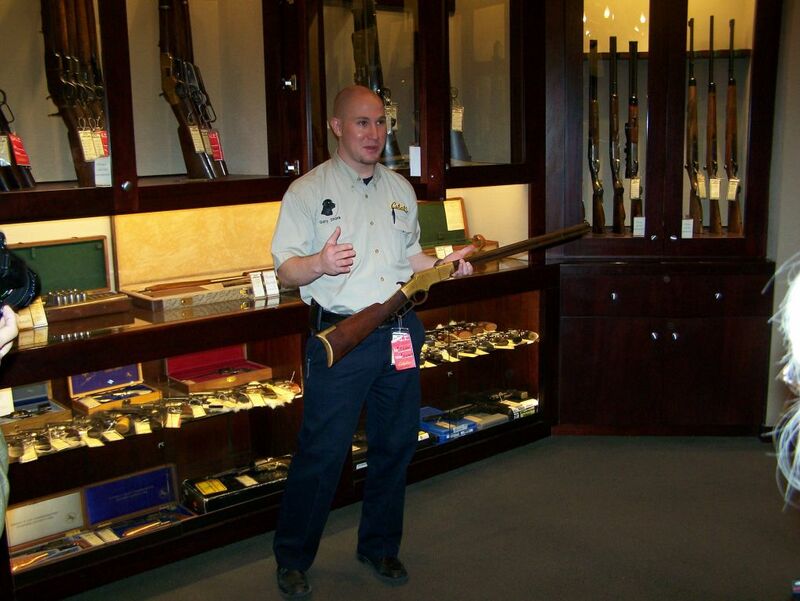 You have to attend this year's Gun Blogger Rendezvous, and you have to buy a raffle ticket! The odds of winning are really good as the number of tickets sold will give you excellent odds.Of course, you must be able to legally own it or you can't win it, for obvious reasons, but other than that all you have to do is to attend the Gun Blogger Rendezvous, buy a ticket (or several to boost your odds), and get lucky! "Win Me" at this year's Gun Blogger Rendezvous! All the money raised at the Gun Blogger Rendezvous goes to Project Valour-IT, so by buying raffle tickets you are also supporting a really outstanding charity to help our injured military folks. Hi-Point and the other sponsors will also be donating some neat stuff for door prizes so everyone who attends will definitely walk away with some great swag. We owe a big THANKS to Charles Brown, the head guy at Hi-Point and MKS Supply, for generously donating this very cool rifle to our fund raising raffle. If possible, Charlie is going to try to attend this year's Rendezvous in person, so keep your fingers crossed! It's only 41 days until this year's Gun Blogger Rendezvous, and so far the number of registrations sent in for the Rendezvous are critically low. There are a number of factors that probably are contributing to this including the state of the economy, higher air fares, and other factors, too. Some folks who usually attend the Rendezvous every year won't be there this year due to circumstances beyond their control, but are still planning to be there next year. It has been suggested that the Rendezvous should be moved closer to one place or the other, but any move closer to one region is farther from somewhere else. 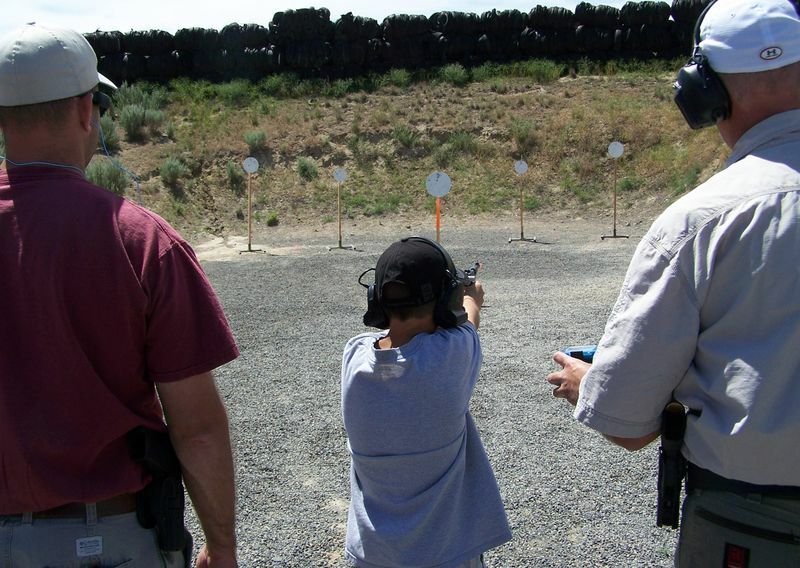 Reno is one of the most gun-friendly places around, and if you make a list of all the factors, there are few, if any, places that score as high as Reno. It is also important to me that the location is at least close to my resident time zone. Trying to set up a convention over the phone is enough of a project as it is, without having to deal with a large time zone difference too. The Silver Legacy hotel people have been really good to work with, and without a really helpful bunch of folks in the group sales department, the Rendezvous wouldn't be possible, at least if it's put on by only one person (me). The gang at Western Nevada Pistol League have been great in letting us use their pistol bays and loaning us steel targets, stands, and timers. Not every club would do that for us. You don't find a 1,000 yard rifle range everywhere either, and the Pyramid range just outside of Reno is excellent. Having the Quick Cal Eilrich, the Cowboy Fast Draw Association's founder only 20 miles away in Fernley, Nevada, is a big help as it makes setting up a Cowboy Fast Draw event for the attendees possible. Having 23 restaurants available in the resort hotel complex is handy, as you can always find something to eat at the rendezvous 24/7. For the Rendezvous to be successful a minimum number of rooms must be occupied at the hotel each night, which in turn, gets us the free internet access, discounted room rates, and most importantly, the free use of the Silver Baron 'B' Hospitality room, where a number of our activities are held. If we were not to get the Hospitality Room for free, most, if not all of the registration receipts would go to renting them instead of going to Project Valour-IT. Some things, like the Friday morning breakfast have a minimum number requirement for the hotel to serve it. At the moment we are below that point. The status of the breakfast, at least as originally planned, is still up in the air. To get good sponsorships and valuable donations of guns and so forth for the Valour-IT fund raiser raffle, I need to be able to show to the sponsors that they will be getting some good exposure for their companies and products. One of the first questions they ask is about attendance. The bigger our Rendezvous, the more sense it makes for the sponsors to donate more valuable items. They only have so much it the budget to spend, and to stay in business, they need to get the most bang for the buck, and you certainly can't blame them. It is critical for the continued success of the Rendezvous that we have enough folks show up. This year's Gun Blogger Rendezvous will absolutely go on as planned, and all of the activities originally on the tentative schedule are still planned. 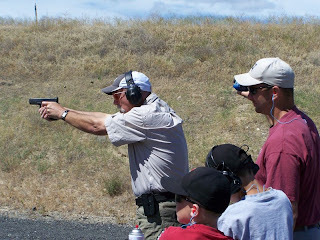 We will still get in lots of range time, lots of socializing, a pizza feed, and some other activities too. We will still have the raffle on Saturday night, as we have done in the past. If you are still undecided about attending, send in your registration and book your room ASAP. You definitely will be glad you did, as we always have a good time. If you have attended the Rendezvous in the past, but other things have come up and you can't be there this year, please encourage others to attend. Tell them about the good times you've had at previous GBR's. If you are a blogger and you've attended in the past, help to get the word out on the Rendezvous. If you can, put up a post describing your previous attendance from your point of view. Let folks know that it's a weekend like no other, and the socializing alone is well worth the trip. When we were over at the Steel Challenge match in Yakima, Washington a few weeks ago there were two young brothers shooting in out squad, and they were shooting very well, particularly considering their age and experience. KeeWee grabbed the camera and got a video of one of the lads shooting the toughest Steel Challenge stage of all, 'Outer Limits'. On this stage you shoot two plates from one position, them move to a second position and shoot the remaining two plates, and then shoot the stop plate last. It's not that easy, as there are a lot of things that can go wrong! 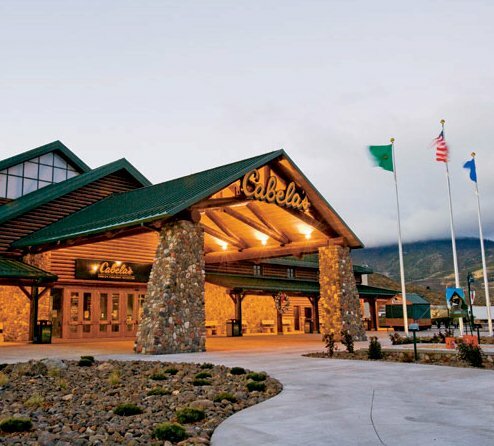 The Beautiful Cabela's Store in Reno. Great news! 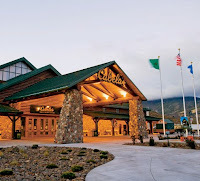 I just got off the phone with the great folks at the Cabela's store in Reno, and they will be joining as a Co-sponsor at this year's Gun Blogger Rendezvous. With all of the door prizes and raffle prizes at each year's Rendezvous, it's just not possible for everything to be shipped to me, and for me to be able to drag everything to Reno on the airplane. In previous years HiCap Gun Works in Reno has served as a shipping destination for all the swag, but HiCap has sold their business to The Safe Shot Indoor Range, and have closed their doors. Gary and Jamie at the Reno Cabela's have agreed to step in and help us out by serving as our shipping destination for GBR-V. YAY!!! Some of you that were at GBR-III may remember Gary, as he was the one who gave us the guided tour of the Cabelas store that year. 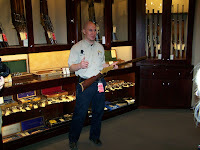 We are planning on doing another guided tour at Cabela's again this year, most likely on Thursday afternoon. The gun library is really something to see, and the fudge shop, YUM! They even have a restaurant where we had lunch. If you are still undecided as to if you are going to attend this year's Gun Blogger Rendezvous, this is one more reason to come to Reno and join in on the fun. 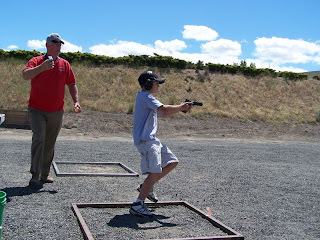 When KeeWee and I were at the Washington State Steel Challenge Championships in Ephrata, Washington a couple of months ago I spoke to a fellow from the Yakima gun club and found out a bit about their regular Steel Challenge matches. It sounded like a great bunch of folks, so KeeWee and I decided we should make a weekend run over to Yakima and give it a try. We haven't been having the best of luck getting to and from matches lately, but when you drive old equipment, sometimes that happens. The RV now had a new motor in it, and it seemed to be running really well, so why not go for it! From where we are located on Whidbey Island it takes a minimum of two to two and a half hours to get to any match we go to, so the three and a half to four hours to Yakima wasn't that much farther. After talking on the phone with some of the Yakima folks, I determined that they had a really nice range, club house, and grounds, and that we could park the RV there the Friday night before the match. So off we went! The drive went smoothly and without incident, and I didn't even have to lift the hood even once! Perfect! 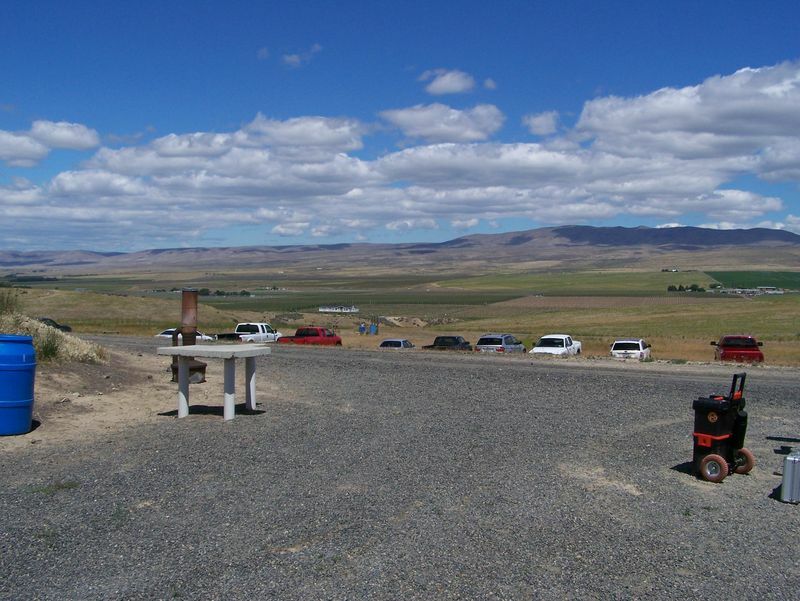 When we got to the range, which is a few miles East of Yakima near Moxee, Washington, we were very impressed with the facilities, including the irrigated lawns and well kept grounds. The two story club house had huge picture windows on the side facing the valley, and the view was spectacular. With my back to the range, looking out across the valley. The picture doesn't do justice to the view! 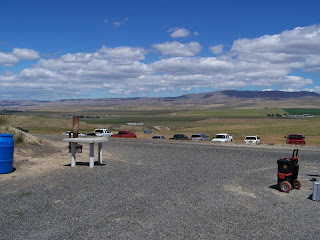 After we had gotten squared away as to where we would park the RV for the night, we headed back to Yakima to meet up with Ty, the club's head number cruncher, and his family for dinner in a Yakima restaurant. After dinner we headed back out to the range to get some sleep, as the next day was going to be a long one. It seemed like morning arrived far too early, but we could see it was going to be a beautiful day, partly cloudy, lots of sun, and hopefully a slight breeze to keep it from getting too hot. That's exactly how it turned out, too, and that was good for us as those of us from Western (rainy) Washington don't deal with the heat very well! I pitched in and helped out getting the plates hung on their posts, since a little help is always appreciated, and I was already there anyway. The match was like most any other Steel Challenge match, and it was well run and organized, like the most of them usually are. What really made the match fun, though, was the friendliness of the club members, and most importantly, watching the young shooters compete. We had two lads in our squad, and they were really outstanding. It was obvious that Dad had done an excellent job of teaching range safety and gun handling. Even when dealing with malfunctions, they stuck with the problem, resolved it, and finished the string. Very impressive! Already a good shooter, but is definitely going to get better! Yes, they even painted a lot of the plates! "Outer Limits" - The toughest of the Steel Challenge stages, where you shoot two plates from one box, then run to the center box and shoot two more, then shoot the stop plate. He's doing an excellent job! "Pendulum" - A stage that looks much easier than it is! A beautiful facility, great scenery, friendly folks, lots of fun, and no one taking any of it too seriously! What more could you ask for? We had a grand time, and we will definitely be making the trip across the mountains to Yakima for some more fun when we can. If you are anywhere in Eastern Washington and would like to give Steel Challenge a try, here's the place to go. 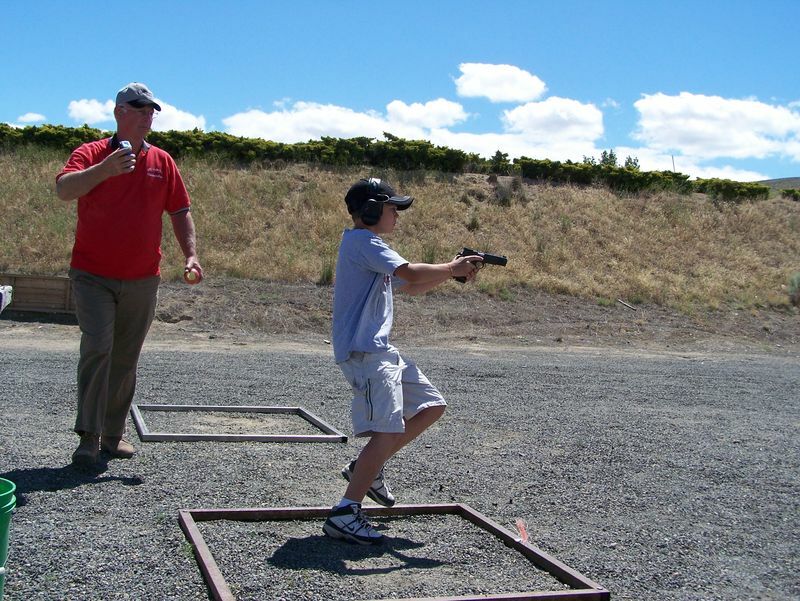 Check out the website for the Yakima Rifle & Pistol Association. You can find their contact info on their website. Maybe we'll see you at one of their next matches! The brothers refused, saying they would settle for $2 million, but they wanted the recognition by having a label, "The Goldberg Air Conditioner" on the dashboard of each car in which it was installed. Now old man Ford was more than just a little anti- Semitic, and there was no way he was going to put the Goldberg's name on two million Fords. And so to this day, all Ford air conditioners show - Lo - Norm - Hi - Max -- on the controls. All Thanks to Uncawho for providing the story! At a TEA Party gathering in Oak Harbor, Washington a couple of months ago I got the opportunity to listen to The Reverend Wayne Perryman speak, and hearing him was well worth the trip. The other speakers, not so much, but Rev. Perryman was excellent. It has been in the news lately that the TEA Party movement was supposedly a racist movement. The Rev. Perryman addressed this specific topic ten months ago, right after Jimmy Carter made the same claim. Although this video is a bit over seven minutes long, it's worth watching clear to the end. Yes, he does plug his book, what the heck, it sounds like a book that might just be worth reading. at the Silver Legacy Hotel in Reno, Nevada. The winner MUST be present to win. It is up to the raffle ticket purchaser to verify that they can legally receive and own this pistol where they live, and the winner must be a resident of the United States. If they cannot legally own this pistol, they are automatically disqualified from the raffle, no substitution or other prize to be awarded, and there will be no refund. Important: To win a gun in the raffle, make sure you can legally own it before you buy a ticket. 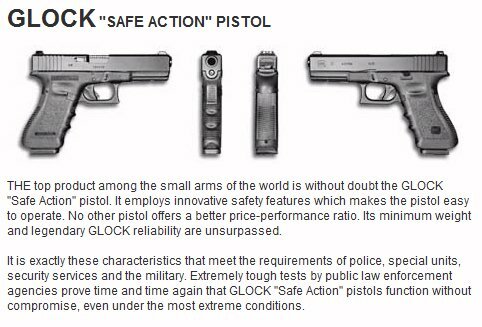 The new Glock will be raffled in the fund raising raffle for Project Valour-IT. However, this year the raffle will be open only to attendees of the Rendezvous, so some lucky attendee at the Rendezvous will win a brand new Glock! If you are planning on attending the Rendezvous this year, be sure to bring plenty of money for raffle tickets, as your odds of winning a new Glock, a $2,000 dollar training session at Front Site, or other very valuable prizes will be very good. If you are a gun blogger, mil blogger, shooting enthusiast, competitive shooter, or a reader of the blogs that cover shooting and 2nd. amendment stuff from time to time, you are all welcome to attend. You do not have to be a blogger to attend. The cost of the registration for the Rendezvous is low, and the cost of Silver Legacy accommodations is very reasonable, in fact, the Silver Legacy rooms are either the same, or less expensive than last year, depending on the night of the week. Fellow bloggers, please give me a hand in getting the word out on the Rendezvous any way you can. It all helps. If you have attended in the past and are planning to be there this year, why not encourage some of the other bloggers in your area to attend this year too? We could stand to have a few more folks show up as one of the first questions the possible sponsors ask is how many will be attending. The more folks attending, the easier it is to get more sponsors. Last year's Gun Blogger Rendezvous was the best ever, and this year we are adding several new things to make it even better, so you really don't want to miss out! sometimes you just want to find a cave and crawl all the way into the back and hide for a while until the weird stuff blows over. That's what it's been like since last Friday morning around here. It started out on Friday morning when KeeWee noticed that there was a faucet on the outside of the house that didn't have a handle (hand wheel?) on it, and since it was close to one of her gardens, she asked if i could put a handle on it so she could use it for watering. What could possibly go wrong, right? Check the size of the shaft on the faucet, run down to the hardware store, pick up a handle, come home, and put it on. One screw, shouldn't take ten minutes for the whole job. Right.... There are two hardware stores in our area. The closest one didn't have anything even close. The store farther away only had one, but it didn't look quite right as it looked like the faucet required a bit of offset to the hub as part of the hub fit down onside the faucet. Maybe the one choice they had in stock would work until I could find a better one. I brought it home to give it a try. To put it on required removing the center screw threaded into the faucet shaft. The screw wouldn't unscrew, as it was frozen into the faucet shaft. 45 minutes of penetrating oil and very careful Vise Grip work and the screw was finally out without breaking it off in the hole. Was the tide finally starting to turn on this project? Nope. The new handle didn't fit into the faucet far enough to engage the square portion of the shaft. Well, I'll just go rob a handle off of another faucet and use that one until I can get the right one, I figured. Sure enough, I grabbed a handle from another faucet and put it onto the desired faucet without problem. I opened the faucet, and a good stream of water came rushing out, just like it was supposed to do. I hooked up the garden hose for KeeWee and off she went merrily watering the flower beds. Everything was finally working like it should, and I could get back to the things I had planned for the day, or so I thought. As I was walking by the corner of the house I noticed that there was a solid sheet of water coming out of the wall behind the siding. Oh Joy! Since it is a daylight basement type house, that means that the pipe is probably split inside the wall and is now flooding the basement. I shut off the faucet and headed downstairs to discover well over an inch of water standing in the basement. I shut off all the water supplied to the house and went out to the barn to grab a wet-or-dry shop vac so I could start sucking up the mini-flood. KeeWee started moving boxes and other stuff now standing in the water. A couple of hours later we had everything that got wet set out so it could dry, and most all of the water sucked and mopped up. Now I could try to find the broken pipe and replace it. Fortunately I could just reach the frost free type faucet up between the floor joists, and I could see a definite split in the pipe. After a bit more fun I finally managed to unscrew the frost free faucet assembly and run down to the hardware store for a replacement. They had the right length and thread version in stock, and it was only forty bucks for the faucet. I brought it home, teflon taped the threads, and carefully installed it, being careful not to break the copper pipe supplying the faucet. I turned the water back on, and checked the joint and faucet for leaks. Not a drop! Perfect! I went out and put in the screws anchoring the faucet to the siding and re-connected KeeWee's garden hose. KeeWee's watering could now get back underway. Right? Nope. Being prone to double check everything, I went back down stairs and the bone dry connection was now starting to drip. Ok, back outside, disconnect the hose, unscrew the faucet's flange from the siding, then back down stairs to take one more turn on the pipe to further tighten the connection. I was just barely able to get the full 360 degrees I needed, 370 probably wasn't an option. The additional turn tighter had stopped the dripping, so I went back outside and put the rest of the project back together. Finally everything was working. KeeWee could water, nothing was leaking, and the new faucet came with a brand new handle, so the original issue was now resolved. By now, most of the day was gone. I cleaned and checked over the race guns, and made sure everythingwas ready to go for Saturday morning, as we had a fun day planned. We were going to go over to Bremerton and shoot the KRRC fun Steel match, then go have a meal with some of our friends fro mthat club, them return home. Murphy, however, had other ideas. Saturday morning we loaded the van, and headed for the Clinton to Mukilteo ferry to get to the mainland. From there it was a few miles East to I-5 South, head South for five or ten miles, then pick up 104 headed back West to Edmonds, where we would catch the ferry to Kingston. From Kingston it's about a 25 minute drive to the range. We made it to I-5, and headed South. We had only gone a mile or so when the right front tire started making an odd sound, sort of a whining-shimmying-thumping sound. Clearly not a good sound. I dove for the nearest exit and just as I was entering the exit the tire pretty much exploded. There was a large amount of noise and rubber pieces flying in the air. Keeping it straight was a bit of a challenge, too. I managed to get down the off ramp to surface streets, then into a parking lot. At least we were stopped, and out of the freeway traffic. I got out to have a look at the tire, and it didn't look so good. The tread and steel belt was mostly there, but the sidewalls were mostly gone. So was the hub cap. I checked the spare, and it didn't seem to have a full charge of air. A few months ago I decided to join AAA, so we gave then a call, and within 15 or 20 minutes a truck pulled up. The driver aired up the spare and swapped it on for us, and we were back on the road. I called the range and sent a message to the Match Director to bring a couple of score sheets with him and we'd catch up with him somewhere on the range and shoot as much of hte match as we could. As we got within about a half a mile of the Edmonds ferry dock we could see there was another problem. The traffic was backed so far up the hill that we couldn't even see the water from the back end of the line. If we waited in line we would not be able to get to a ferry boat for several hours as the ferries run every hour and there were enough cars backed up to fill two or three boats, maybe more. The match would be over before we even could get there. The only sensible thing would be to retrace our route home and write it off as a lost cause. By the time we got close to the Mukilteo ferry, though, it was now backed up too. We had to wait for about an hour and a half before we could get on to a ferry and get back to Whidbey Island. Finally we made it home, and I was, by then, bushed, so I took a nap. As a small highlight of the weekend, the nap went well. At least the next day was Sunday, and there was nothing planned for the entire day. Maybe I could even get out and do a little practicing. So, Sunday morning I was leisurely having my first cup of coffee when KeeWee comes in the front door and announces "You better not go look in the well house!". Translation: "You better go look in the well house ASAP, but you aren't going to like what you see!" She was right. One of the 80 gallon pressure tanks had sprung a leak and it was spraying out water, flooding the well house. Here we go again! Today I went back across the ferry to head down to the Pull-a-Part auto wrecking yard to pick up a good pair of front rims and tires for my van. While I was there I grabbed a pair of rear brake drums, as my current drums aren't the best, and should soon be replaced. The trip was successful, and earlier this evening I installed the new rims and tires. All four corners now have good rubber. In the midst of all the excitement over the last few days I also picked up a project boat that was priced so I just about couldn't pass it up. It belonged to a friend of a friend, and he hadn't used it in the last two years and had decided it was time to get rid of a lot of his stuff that was lying around the place. It's going to take some work to get it shipshape, but there doesn't seem to be too much beyond a lot of elbow grease to get it seaworthy. Overall it looks really sound, but it needs some cleaning and tuning, for sure. I'll try to get some pictures posted once I get it home. That happens tomorrow morning. ................... and that's why I haven't been posting for the last few days! Gun Blogger Rendezvous - Is Your Reservation In Yet? This year's Gun Blogger rendezvous is only 61 days away, and time is flying by! Do you have your hotel reservations and Rendezvous Registration set up? If not, you better get on it right away! The Gun Blogger Rendezvous is like no other event as it's all about the gun bloggers themselves. We don't have a big name celebrity speaker where the attendees sit in the seats and are basically spectators. That's not to say that there won't be some really interesting people there, though. Last year Alan Gura was there, and we all got to learn a lot about the legal stuff he's been up to lately from an insider's perspective. The Rendezvous is not a side event for some other much larger happening like the NRA convention. No, at the Rendezvous the attendees themselves are the reason to be there. The discussions in the hospitality rooms go well into the night every night of the Rendezvous. 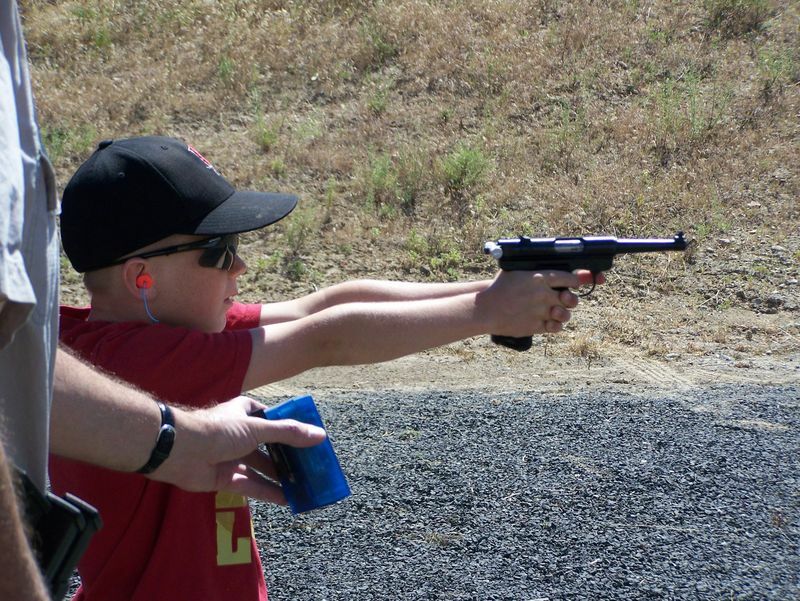 Sure, during the day we get in plenty of shooting, including rifles and pistols at targets out to 1,000 yards, Steel Challenge against the clock, even with a bit of coaching from Molly Smith, who's not only a blogger, but is also the Steel Challenge Pre-Teen World Champion! Plans are also underway for some Cowboy Fast Draw practice under the watchful eye of Quick Cal Eilrich. Quick Cal is the "Intergalactic Fast Draw" Champion (Not really, I made that up, but if it DID exist, Cal would win it!) in addition to numerous National and World Championships. I am also looking into some range time at a new indoor lead-free range in Reno that rents guns, including FULL AUTO goodies! Interested? I thought you would be! Rachel Parsons, representing the NRA. You've probably seen her on TV as the NRA 2nd. Amendment Spokesperson. If you still aren't quite sure exactly who Rachel is, go to Youtube and enter 'Rachel Parsons NRA' in the search box, then watch a few of her television interviews. Very impressive, and you can meet Rachel in person at the Rendezvous. Derek - from "The Packing Rat" blog. An excellent photographer, blogger, shooter, and avid hiker. Oh, and he was also not only the fastest centerfire Steel Challenge shooter, he also won the Cowboy Fast Draw Blogger match. Kevin - from The Smallest Minority blog. Kevin has been to every GBR since the beginning, and it just wouldn't be The Gun Blogger Rendezvous without him. It's worth the trip just to meet Kevin in person. That's just a sample of some of the cool kids that will be there at this year's Gun Blogger Rendezvous. I'll be posting some more on who's going to be there in a few days. For everything you need to know to make your group rate hotel reservations at the Silver Legacy in Reno and how to register for the Rendezvous, head on over to the Gun Blogger Rendezvous blogsite! e-Postal Match is Now Underway! I apologize to Sailor Curt for being so slow in getting this notice posted, but the July e-Postal Match is now fully underway over at Curt's place, The Captain of a Crew of One. This match is a good one to get you a bit of practice on your reloads. LOTS of practice, in fact! Don't forget, every entry you send in gets your name in for the drawing for the $50 gift certificate from Cheaper Than Dirt. The more entries you send i n, the better your chances! Tomorrow morning bright and early Keewee and I are firing up the Land Yacht and heading East across Snoqualmie Pass to Ellensburg, and from there South to Yakima, and then East a bit more to Moxee, WA. and the Sun Valley Gun Club's range. On Saturday they shoot a Steel Challenge match, and we've never been to one of their matches before, so we decided to go check it out. I met one of the club members at the State Championships in Ephrata a few weeks ago, and we were invited to come have some steel shooting fun with them. If all goes according to plan we'll be meeting up with some of the club members Friday night for dinner, then parking our land yacht at the range for the night. Saturday we'll shoot the match, then most likely we'll drive home Saturday afternoon. Since this is the 4th of July weekend, traffic will probably vary from miserable to downright ugly, but if I've guessed right, we should miss the worst of it, I hope. James Austin showing how to shoot Steel Challenge's "Outer Limits" at Kitsap Rifle and Revolver Club's first Full eight stage Steel Challenge match held this Spring. SEDRO-WOOLLEY, Wash. - Washington State's James Austin of Fox Island shot his way to the Revolver division winner's circle for the second year in a row at the U.S. Practical Shooting Association (USPSA) Area 1 Regional Handgun Championship, this past weekend. Austin won six of the 11 stages and held the lead for the entire match to finish with a final score of 1190.1892, outpacing runner-up Bret Draughn of Peoria, Ariz., by more than 95 points. This is the fourth time Austin has won the title since 2003. "Jim shot a great match and never finished below fourth on any stage. He showed the kind of consistency that every shooter needs to win, which probably explains why he's won this match four of the last eight years," said Michael Voigt, president of the U.S. Practical Shooting Association. Draughn, who never came within fewer than nine points of Austin, took second by winning four stages in the match and posting a final score of 1094.8765. Third place went to Roger Edington of Renton, Wash., with a final score of 948.4072. Kal Kirby of Soda Springs, Idaho, and Jerry Vanderwerf of Scappoose, Ore., rounded out the top five finishing fourth and fifth with scores of 904.1425 and 855.807 respectively. In the Seniors category for shooters over 55, Roger Mousley of Draper, Utah, took top honors and finished sixth overall with his final score of 822.0419. 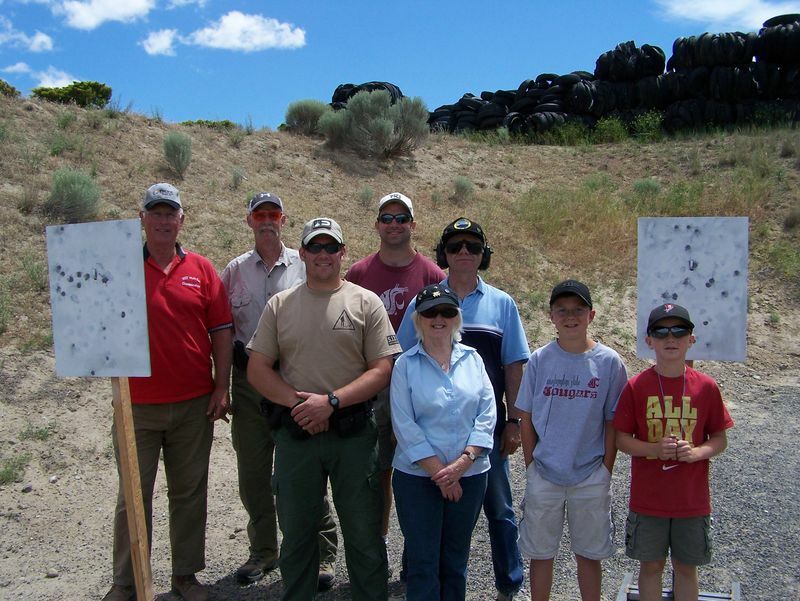 The match, which was held June 24-27 at the South East Idaho Practical Shooters range in Idaho Falls, Idaho, drew 325 top shooters. Area 1 is one of the eight USPSA shooting regions in the country and is made up of Alaska, Idaho, Montana, Nevada, Oregon, Utah, Washington and Wyoming, but shooters from 12 other states, as well as Canada, competed for the championship title in USPSA's Open, Limited, Limited-10, Production, Revolver and Single Stack divisions. The sport of Practical Shooting was formally established in 1976 but traces its roots back to the 1950's and the quick draw "leather slap" competitions that grew out of America's love affair with the TV westerns of that era. Today the sport boast more than 19,000 shooters and represents the upper echelon of the shooting sports with many of its top competitors actively training law enforcement and military units on the shooting techniques and equipment developed in competition. To learn more about the U.S. Practical Shooting Association, or to find a club in your area, visit www.USPSA.org or follow @USPSA_Shooting on Twitter.